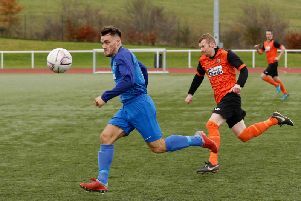 Lanark United beat Division 1 Blantyre Vics 2-1 at Moor Park in Saturday’s Ardagh Group West of Scotland Cup first round clash, writes Tam Anderson. It took only five minutes for Hugh Kerr to put Lanark ahead when his first shot was blocked on the liine but he reacted quickly to net the rebound from close range. The visitors’ Nadeem Zeb had a great chance well saved by keeper Gareth Hallford, who then turned a Kerin Coleman shot over the bar. On 32 minutes Vics defender Graeme Watson was red carded for violently pushing Danny McHugh head first into the enclosure wall. Kerr then netted his second when he headed in a right wing cross from McHugh. On 46 minutes, Vics’ Dale Jones made a great forward run and saw his first effort blocked by Hallford but he followed up to score. Lanark got a 74th minute penalty when sub Jordan Fraser was fouled inside the box. But Cammy Lawson’s penalty went wide of the keeper’s left hand post. 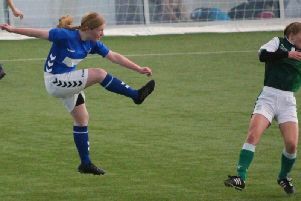 United held on to reach the next round against Kilsyth Rangers at Moor Park on a date to be arranged. * Lanark have a home tie against Rossvale in the Macron Scottish Junior Cup fourth round, KO 1.45pm on Saturday, November 24.